Cornell’s Urban Horticulture Institute (UHI) has released the second edition of its Woody Shrubs for Stormwater Retention Practices (Northeast and Mid-Atlantic Regions). The updated and expanded 57-page guide is an essential resource for choosing plants that can provide low-maintenance, attractive cover for filter strips, swales, rain gardens, and other stormwater retention and infiltration practices. In addition to profiling more than 35 shrubs—including their hardiness, sun and soil requirements, potential pest issues, and deer resistance—the guide also details site assessment and design considerations for stormwater retention structures. Descriptions also include cultivar information and ecological impacts, such as attractiveness to pollinators. Download the guide here. We coauthored this story questioning commonly held beliefs about “fall hazards,” mostly as it applies to B&B trees, but we also discuss the interaction of the fall season with other production methods, like bare root. The section, “The Five Branches of Transplanting Success,” should be of interest to anyone planting trees, period! With the help of Nina Bassuk and others, we tried to break down the complex interactions at work with transplanting. This article originally ran in Arbor Age (Fall 2015). The nursery industry is reluctant to dig certain species of trees in the fall, yet the “fall hazards” lists can vary significantly among nurseries. Also varying is the experience of nursery customers, including city foresters who plant hundreds or thousands of trees each year. In addition to digging season, there are other interacting factors at play in the fall planting picture. Tree Pittsburgh Director of Urban Forestry Matthew Erb has overseen the planting of more than 25,000 trees (mostly B&B) since 2008. “I’m sure if you look hard enough, you will find nearly every species on someone’s fall hazard list,” he says. Chris Luley accepting his R.W. Harris Author’s Citation Award, granted to authors for sustained excellence in the publication of timely information pertaining to the field of arboriculture. In early August, at the International Society of Arboriculture (ISA) Annual International Conference and Trade Show in Orlando, Florida, three of our New York urban forest luminaries won prestigious awards. Cornell Urban Horticulture Institute Director Nina Bassuk received the Alex L. Shigo Award for Excellence in Arboricultural Education. Urban Forestry LLC Principal Chris Luley received the R.W. Harris Author’s Citation. USDA Forest Service Northern Research Station Project Leader and Research Forester David Nowak received the L. C. Chadwick Award for Arboricultural Research. In the past, Nina also received the Research award and David also received the Author’s award. What follows are the videos that ISA produced for each recipient. We can take pride in the accomplishments of these New York-based professionals who, among their many good works, have contributed immensely to the efforts and mission of the NYS Urban Forestry Council. The Frederick Law Olmsted award recognizes an outstanding individual with a lifelong commitment to tree planting and conservation at a state or regional level. Further, it honors someone who: shows outstanding personal commitment over their career or lifetime for the betterment of the environment, mobilizes people in tree planting and care, makes unique or extraordinary contributions and commitment with regards to tree planting, landscape, conservation, education, or research, and serves as a role model and mentor to others. Thanks to Dr. Bassuk’s research and extension efforts in bare root transplanting technology, tens of thousands of trees have been planted in New York and the greater Northeast that would otherwise not have been. 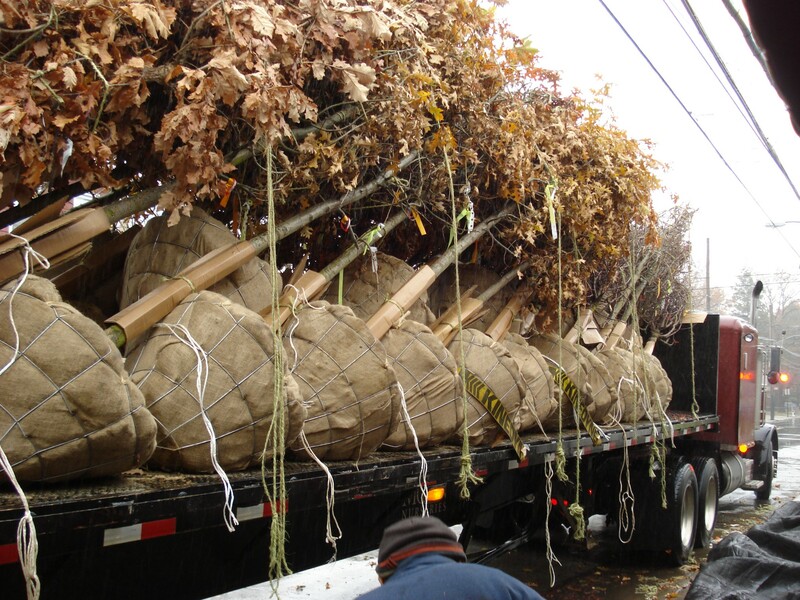 In 2014 alone, 8800 bare root trees were purchased by 93 municipalities across 11 states from Schichtel’s Nursery in Western NY. Owing to Dr. Bassuk’s research and extension efforts on CU-structural soil, there are thousands of trees internationally that were planted in conditions that would not have otherwise supported trees. The partial list of CU-Structural Soil installation sites worldwide is 40 pages long. Dr. Bassuk has been the City of Ithaca Shade Tree Advisory Committee Chair since 1985, and she served on the Ithaca Parks Commission from 1991-2003. She served as the President of the NYS Urban Forestry Council from 1990-2001 and thereafter as a Board Member. As part of her plenary talk at the 2014 ReLeaf Conference at Hofstra, Urban Horticulture Institute Director Nina Bassuk held up some underutilized trees that have worked well for her in Ithaca’s urban environs. Among them was ‘White Shield’ Osage orange (Maclura pomifera). In future posts we’ll cover others she recommended, like American smoketree (Cotinus obovatus). ‘White Shield’ is the most readily available cultivar of Osage orange (Maclura pomifera) on the market. Although Osage orange is native to Oklahoma, Arkansas, and Texas, it grows readily beyond its native range. Because of the thorny nature of its juvenile (non-fruiting) stems, it was used as a natural fence for keeping in livestock. By hedging the tree, the juvenile, thorny form is perpetuated. In Ithaca, there is a remnant of such a hedge right in the middle of a residential neighborhood. Osage orange is dioecious, meaning that male and female flowers form on separate trees. This is important because the fruits on female trees are enormous, about 6 inches (15 cm) in diameter. They are a conglomerate of beautiful green seeds and fruit that hangs on the tree until ripe in early fall. They then fall to the ground and could cause injuries and property damage, not to mention the mess. I’ve heard it reported that the fruits repel cockroaches and were sold in urban greenmarkets as a natural insecticide. Luckily, male (fruitless) cultivars like ‘White Shield’ are readily available. ‘White Shield’ is an exceptionally fast-growing form once established. Branches are distinctly upright with glossy green leaves. Another especially beautiful cultivar is ‘Wichita’, selected by the late John Pair. Both of these selections originate from Oklahoma. Osage orange has a lot going for it as a tough urban tree. Once established, it tolerates very droughty, windy, and hot sites. It can handle a wide range of pH, including highly alkaline soils, and is purported to be tolerant of wet conditions as well. It can also tolerate salt spray. It has no serious pests, and transplants easily. It matures at 20 to 40 feet (6 to 12 m) tall and similar spread. Nina Bassuk and Peter Trowbridge, rear center, participate in landscape installation along with students in their “Creating the Urban Eden” class. In this second blog post about Nina Bassuk, we learn about her extensive home landscape. She is also an accomplished flutist who graduated in 1969 from the Music and Arts High School (now known as the Fiorello H. LaGuardia High School of Music & Art and Performing Arts) in her native NYC. Nina says that recently she reunited with some members of her high school class to play chamber music at the art exhibit of some other former classmates. She is also accomplished on the piano.